The exhibit showcases the rich history of art and science in Providence and provokes you to consider the consequences of environmental change on local biodiversity. Premiering original watercolors of plants by Edward Peckham together with matching specimens from the Brown University Herbarium, collected by William Bailey and others, explore the lost Cat Swamp habitat of the Wayland and Blackstone neighborhoods on the East Side. 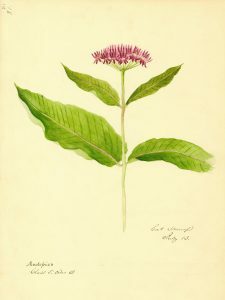 This exhibition is the collaborative work of the Brown University Herbarium, Rhode Island Historical Society (RIHS), Rhode Island Wild Plant Society (RIWPS), and John Hay Library. This entry was posted in Announcements, Announcements, Collections, Exhibits & Events, Exhibits & Events, Featured Resources, General Interest, Hay, Home Page, Josiah Carberry, New Resources, New Resources & Services, Special Collections, Spotlights, Uncategorized, Uncategorized, Updates from Around the Library by tbowers@brown.edu. Bookmark the permalink.